From big-swinging World Series champions, to big-swinging captains of finance, to hookers, New York used to be the capital of everything that mattered. Entertainingly proving we still excel at pestilence, SickCity. From a quintet of macabre coders, Sick culls disease-related status updates from Twitter (and "soon Facebook"), then ranks the results by city, with NYC currently ranked the illest in the world -- both a reflection on our contagiously crowded conditions, and Mali's underdeveloped social networking infrastructure. To dive in deeper, click on NYC for the nutbaggish-yet-informative updates themselves, all linked to their author's profile and organized by one of six categories covering everything from bacteria + boredom ("yo overall all my experience in Staten IsLandfill was bad: boring family reunions, funeral, and food poisoning"); to epidemics + stay-at-home moms ("So the flu seems to have finally left. Been replaced with the '3 kids home for spring break' bug! "); to whatever the hell is going on with "PMSing + Day One of Non-Smoking Week + very sore throat + pretending to be Catholic for 12 hours". Sick also keeps a running count of illness mentions per day (April 10th: a good day for the flu), plus provides handy bar graphs that display symptom trends over the past 31 days -- an arbitrary time interval, according to February and a handful of aggrieved lesser months. 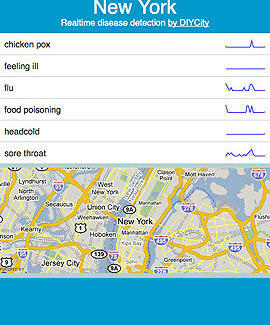 Soon Sick will be able to geo-locate status updates on a GMap, allowing you to avoid the worst plague yet to hit the city, Twitter.